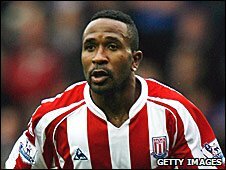 Stoke striker Ricardo Fuller has said he has been told to lose weight by Potters manager Tony Pulis. The 29-year-old was Stoke's leading scorer with 11 goals last season, but has yet to find the net in the Premier League this term. Fuller told BBC Stoke: "The gaffer said that I've gained a bit of weight and that I need to lose some. "I drink a lot of protein shakes and things like that. I need the weight because my main strength is my power." Fuller struggled for match fitness during the tail end of last season after dislocating his right shoulder in the 2-0 defeat at Sunderland in February. A long spell with the Jamaican national team during the summer limited his pre-season fitness programme and Fuller believes he is still striving to get back to his best. "I know I need to pick my fitness up because I didn't have a proper pre-season," he added. "In games, the lads keep putting the ball in the corners so I just keep chasing after it. "I know that I need to get some running done. When I'm on the pitch I just run and run to try and make something out of nothing for the team."